Adventure travel photographer Tiffany Nguyen is constantly inspiring her social media followers to get outside and create their own adventures. So, hitting the slopes with Travel Mindset for #InstaMeetSkiBig3 in Banff, Alberta was an ideal winter adventure for this Instagrammer. With a love for exploring new destinations and capturing all of the stunning landscapes within them, there was plenty of beautiful shots for Tiffany to share with her audience — from exploring downtown Banff to snowboarding SkiBig3′s magical snow-covered mountains. Keep reading to hear more about her take on the iconic weekend! Hi Tiffany! We’re so excited that you’re joining us today! Can you tell us a little bit about yourself and how you got into travel blogging and photography? I’m dentist and adventure travel photographer from Los Angeles. What initially sparked my interest in photography was the outdoors. While camping and hiking, I captured photos and shared them so photography and adventuring just went hand in hand for me. The more I got into photography, the more I wanted to travel and explore different places around the world. I found a passion for sharing my experiences and telling stories through my photos. I travel as often as four to five times a month so my trips are usually pretty jam packed. I try to make the most of my time while traveling so oftentimes I’m up early for sunrise and going all day until sunset. And if the Milky Way is out then I’ll probably be out for some astrophotography too! Whenever I travel, I always want to see and do as much as possible because you never know when you’re going to have the chance to return somewhere. Your most recent trip was to Banff, Alberta for Travel Mindset’s #InstameetSkiBig3. Can you tell us a little bit about the experience? This trip has been one of my favorite winter adventures thus far. It’s the first time I was able to snowboard at all three ski resorts here in Banff and what made it even better was the people I was with. It’s always great to have a fun crew to share these experiences with. The variety of activities we had on this trip always kept us guessing and it was so great to get a new perspective on a place I’ve come to know so well. SkiBig3 offers three amazing ski resorts — Banff Sunshine, Lake Louise Ski Resort and Mt. Norquay. Did you have a favorite? This is a tough one, but I’d have to say Lake Louise Ski Resort. 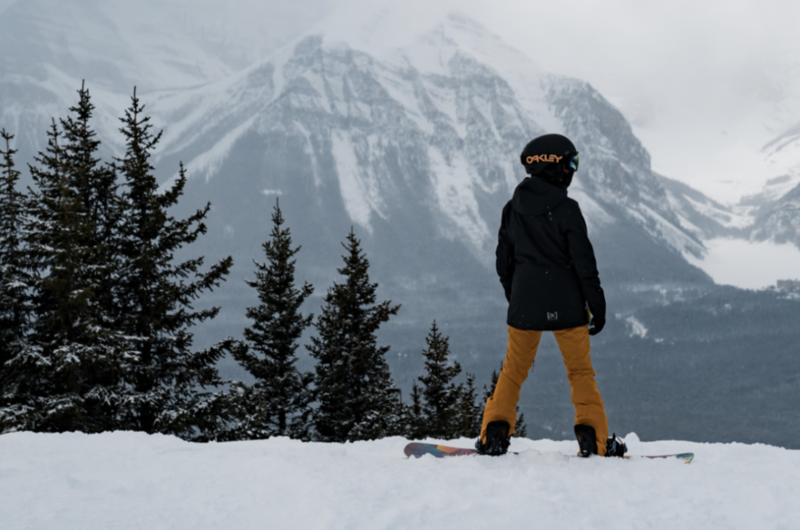 The views here are just unmatched and there’s something about seeing Lake Louise covered in snow while you’re snowboarding that’s just so epic. There’s no other place I’ve snowboarded at that can compare. You’ve adventured through the Canadian Rockies in the past…what was the best part about visiting in the winter time? My favorite part about the Canadian Rockies in the winter time is that there are certain locations that are actually better to photograph in the winter time. You never run out of things to do here and it’s just a special time compared to the other seasons. Even though the temperatures can be quite frigid, the scenery around you is so magical. We saw that you hit the slopes on a snowboard (so fun! )…Are you a long-time snowboarder? I actually grew up skiing ever since I was a kid, but switched over to snowboarding when I was 14 and have stuck with it ever since. Fairmont Banff Springs was your base for the weekend. Have you ever stayed at a Fairmont Hotels property before? What was your first impression? I’ve stayed at a few Fairmont Hotel properties before and have always had a great experience. It’s hard not to be impressed when your hotel looks like a castle from a fairytale! Fairmont Hotels & Resorts are known for their unique services. What was the most memorable part of staying at the Fairmont Banff Springs? I love that the hotel is in the heart of Banff. You’re just minutes away from some beautiful locations to photograph and just a short drive from the slopes. As a travel photographer, what are your top 3 Instagram-worthy photo-ops in the area? In the winter time, I think my top three areas to photograph in the area are Vermillion Lakes, Lake Minnewanka, and the town of Banff. If one of our readers only had 48 hours to spend in Banff, what would you suggest they experience first? I would definitely recommend spending a day on the slopes at one of the three ski resorts, taking a stroll around town, and eating at some of the many amazing restaurants here. And don’t forget to take an afternoon to yourself to unwind at the spa!